When you think of scrappy, boutique automakers that somehow manage to drag themselves along, despite selling products of sometimes questionable build quality and at very low volume, Lotus probably tops your list. Even after multiple stalled projects and firings and departures of different CEOs with different visions, the British brand is miraculously still here. Now, under new ownership once again and with ambitious plans to boot, it admittedly does sound a bit rinse and repeat. But Lotus’s rebirth this time around could be promising than ever before. It means new cars. Down the line, it means more cars than just sports cars. But there’s a lot of work to do to get there first. In May 2017, we learned that Geely, the massive Chinese conglomerate that also owns Volvo, bought a controlling stake in Lotus from Proton. About a year after that, Lotus’s then-CEO Jean-Marc Gales stepped down, citing personal reasons. Just months later, the company appointed Phil Popham as its new CEO. His years of experience with Jaguar Land Rover was no doubt seen as an asset. But for us, the consumers and the nerds, the goings-on of Lotus’s upper management don’t matter nearly as much as their results, the cars. And it’s safe to say that Lotus needs some new ones. Currently, the company only makes three: The Elise, the Exige, the Evora and the occasional special edition. As of late, the Evora is the only daily-drivable Lotus anyone in the U.S. can buy, as the Elise and Exige stopped being sold here in 2011. At this year’s Shanghai Auto Show, Lotus revealed the Type 130, an all-electric hypercar. No specs or details accompanied the unveiling, but Lotus assured me that it’s very close to production. Of course, skepticism is fair. Healthy, even, because the last time Lotus made any kind of noise like this, it was an infamous incident at the 2010 Paris Motor Show. Lotus floored everyone with not one but six car concept debuts. It was an incredible announcement, one that many wanted to see happen. But also no one could really figure out where Lotus would pull the cash for such an ambitious project. Over time, none of the projects came to fruition, not even the new Esprit, which appeared to be the closest to production-readiness and was said to have a Ferrari-slaying 600-horsepower 5.0-liter V8. It was officially canceled in 2013, three years after its conceptual debut. But this time will be different. At least, Geely hopes so. Geely bought Volvo in 2010 and since then, we on the consumer side have seen a massive improvement in Volvo quality and design—and most importantly, sales. Forbes reported Volvo’s sales under Geely hit record highs. In fact, Volvos today are more Swedish than ever, and even find themselves competing with Mercedes and BMW. Geely’s management style seemed to be to give Volvo a bunch of money to do Volvo things and then “left us alone and had the patience as an investor not to take our money but to reinvest it in a new product portfolio,” a Volvo executive told Bloomberg in 2018. Geely, according to Popham, has given Lotus three main things that he believes will give them the ability to succeed. The first? Money. With money, aggressive business plans can be carried out, new product can be developed. “They’ve given us the financial stability to invest way more than we’ve had the ability to do as a standalone business today,” he told me. Recently, Bloomberg reported that Lotus was considering an investment of “at least 1.5 billion pounds ($1.9 billion) to revive the iconic British brand.” Popham said that the quoted figure was actually “conservative,” but declined to give specifics. All of these plants will give Lotus the ability to tap into established programs, engineering, design activity and outsource projects. Obviously, this is a “huge advantage to a small company,” according to Popham. And third, new hires, new talent. Fill out the workforce. Lotus has the ability to build out its team again to get the job done. Things at Lotus were noticeably quiet over the last few years. There just wasn’t enough investment to expand the company, nor the resources to grow the business, according to the new CEO. The company, it seemed, was only able to just keep trotting out new versions of its existing cars. But I suspect part of the reason why Lotus wasn’t simply lost from the public eye had to have been because it’d built up a strong reputation and recognition for itself over the years. Geely, through purchasing Lotus, was also buying that consumer and enthusiast recognition. That’s tough for any company to build up from scratch—and here was one that already had it. Lotus’s first car born under new management is the Type 130, marking the company’s first all-new production car since the Evora in 2008, which feels far more ancient than just a decade ago. The Evora, though good in its own right, is old. It’s time for something new. He said that it would have everything that fans would expect from a Lotus—driving experience, on-road dynamics, performance—but it will also “address and improve some of the hygiene factors that limit the appeal of our products today.” Factors listed included ingress and egress, ergonomics, refinement levels, connectivity. The upcoming and unnamed car would have all of these features that would make it hopefully daily drivable. “It sounds like you are describing an SUV,” I said, suspicious. After all, it was reported in 2015 that a Chinese-built Lotus SUV would be coming in 2019. But that was all under Proton and then-CEO Jean-Marc Gales. Who knows what even happened to those plans. 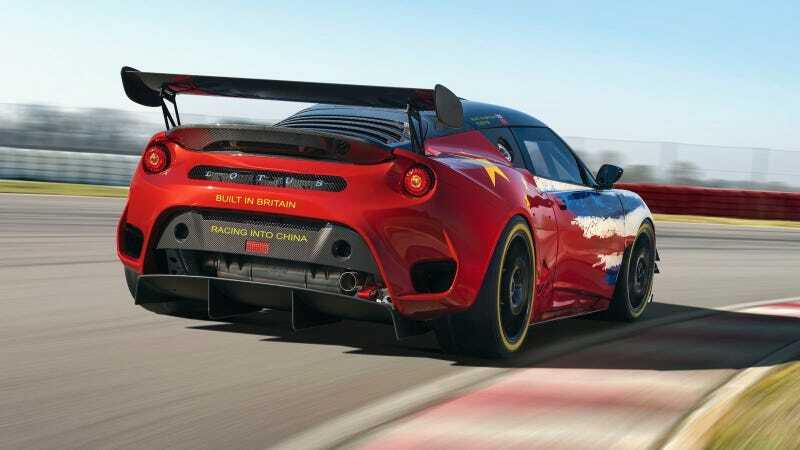 Lotus’s plan, as Popham described it, is to reestablish itself with “class-leading sports cars.” that, it will consider other segments that it can branch into, but for now it seems like Lotus is sticking with the fun stuff. He didn’t elaborate what he meant by class-leading, though. In any case, this feels a trajectory that seems very similar to Porsche’s. Porsche cut its teeth as a sports car manufacturer and now also makes large, luxury SUVs. But some of the difference between Lotus and Porsche comes down to quality and volume. To put it bluntly, Porsche is established. Lotus isn’t. Not yet, at least. It probably won’t be easy, though. Sports cars are usually discretionary purchases, not huge volume sellers. It’ll be interesting to see how Lotus will navigate this. With the unveiling of the Type 130, it’s natural to wonder if Lotus has plans to go all-electric. Given Geely’s other electric brands (Polestar, Geometry, Lynk & Co) it would make sense, as electrification seems to be a priority for the Chinese company. Popham confirmed that “electric propulsion will definitely be part of our strategy in the future and in the longer term.” All future Lotuses will have an electrified offering, which probably means either all-electric or some form of hybrid tech. “It’s about performance, handling, the driving experience and that’s what we think we can do with electric versions of our cars as well,” he said. How Lotus will maintain the “simplify, then add lightness” philosophy with batteries and tech will invariably be a challenge, but one that Popham seems confident that the company will be able to successfully deliver on. As always, it’s easy to paint grand and ambitious plans at the dawn of a new partnership. Lotus has certainly been guilty of this before. Carrying them out is a whole other beast. But this time around, things feel different. Things feel a little less slapdash. A little less thin. Maybe it’s because there’s some serious money involved this time. The excitement, in any case, is tangible. Especially for long-time Lotus staffers like Simon Wood. He is Lotus’s chief technical specialist and joined the company in 1983, some nine months after the death of Colin Chapman. Wood, save for a short stint at Bugatti in the early ‘90s, has remained at Lotus ever since. He told me he sees it a great place to work as an engineer. Wood’s long tenure at Lotus means that he’s seen new owners come and go. I asked him how working with Geely is different than with Proton, Lotus’s previous owner. When Will The Lotus Elise Finally Get Really Cheap?